Shares in construction and outsourcing giant Carillion have plunged by more than 40% after it issued a profit warning and its chief executive quit. The global firm said it was taking an £845m hit after a review of badly performing contracts, and that it would suspend dividends for this year as it seeks to shore up its finances. Carillion, which in the UK runs services for hospitals and schools and manages smart motorways, which use technology to manage traffic flow, said full-year results would miss previous expectations. It prompted a big shares sell-off that knocked two-fifths, or more than £300m, off the group's market value in early trading. The stock closed 39% lower. Carillion, whose recent projects include the expansion of Liverpool's Anfield stadium and the redevelopment of Battersea Power Station, enjoys annual revenues of £5bn. It employs more than 48,000 people worldwide, which in the last financial year included 19,000 in the UK. 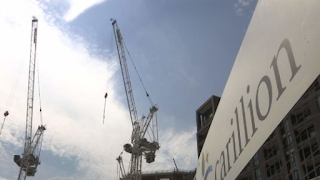 Carillion is counting the cost of four "challenging" construction contracts including three in the UK and one in Qatar, as well as that of exiting markets in Canada and the Middle East that it had already earmarked to leave. The three UK projects are public-private partnerships - types of contract that in the past have seen the group build more than 100 schools under public sector contracts. 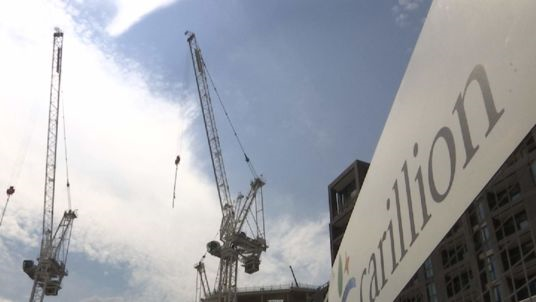 Carillion said its construction problems meant it would be borrowing more money than expected in the first half of the financial year and would miss a full-year target of cutting this back. Chairman Philip Green said: "We have therefore concluded that we must take immediate action to accelerate the reduction in average net borrowing and are announcing a comprehensive programme of measures to address that. "We are also announcing that we are undertaking a thorough review of the business." Carillion chief executive Richard Howson has stepped down with immediate effect and Keith Cochrane, previously senior independent non-executive director and former head of engineering firm Weir Group, is taking over as interim boss. Nicholas Hyett, equity analyst at Hargreaves Lansdown stockbrokers, said: "Carillion looks like it's trying to bail out a supertanker with a soup spoon. "Despite the group's best efforts debt is continuing to climb, and at an increasing rate, while the construction business seems to be hitting one hurdle after another." He said investors would fear a significant cash call could be on the horizon.